One day, two parishioners were walking home from Seatoun parish. It was pouring with rain. They sat down at a tram stop. They said to each other “let’s fundraise so we can have a church here.” So they held dance and card nights. 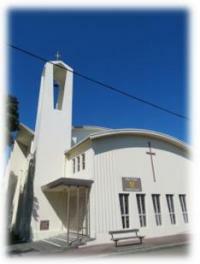 After they had collected enough money they built the church in Miramar called Holy Cross Church. Has it always been a church on its own? Actually, no it hasn’t. It was originally part of St. Marys of the Angels parish until 1902. Then it was part of St. Anne's until 1919 and then St. Patrick's until 1936. Finally it became a parish in its own right. It has been an independent parish for 76 years. Who has been a priest? The current priest is Father Kevin. The priest before Father Kevin was Father Peter. There were many other priests before Father Kevin and Father Peter. We remember the great work they have all done to help make our parish the community it is today. When Father Peter left we had a going away party for him in the parish hall. It was sad when he left. We all missed him very much.